Soco Falls is easy to get to from Maggie Valley. From the Valley go west on Hwy. 19 up and over Soco Gap. The parking area for the trail is on the left 1.4 miles past the Blue Ridge Parkway turn off. The parking area is just above the falls and the trail is short but steep. 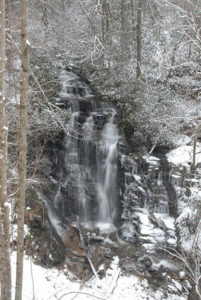 Waterfalls continue to be the most asked for feature of Maggie Valley. SOCO FALLS - Soco Falls is located just past the Blue Ridge Parkway on the way to Cherokee. There is a small sign that indicates the parking area on the left of the road. the trail is short but steep that leads to an observation platform overlooking the unique double falls. MINGO FALLS - Mingo Falls is on the Cherokee Indian Reservation (Qualla Boundary), just outside Great Smoky Mountains National Park. No special permits are required for access to the reservation. At 120 feet tall, the waterfall is one of the tallest and most spectacular in the southern Appalachians. GRAVEYARD FIELDS WATERFALLS - Just off the Blue Ridge Parkway heading north, the hiking area includes two beautiful waterfalls, the multi-tiered second falls and the tall cascades of the upper falls. The trails meander through valley that was once used for grazing cattle around the turn of the last century. The hikes are moderate. SAFETY - As will any water feature, the trails, rocks and surrounding aresa are often wet and slippery. Use caution when ever hiking around water.